Meccans came out victorious at the battle of Ohad, but Abu Sufyan realized that their victory was incomplete until Islam and Muhammad were totally removed from Arabia.The strategic aim of the Meccans was nothing less than the destruction of the Muslim community as such and the removal of Muhammad from his position of authority. Inspired by this aim, and to rectify the failures of the past, the Meccan leaders began preparations for an all-out war; a war that would put an end to all other wars by blotting Islam out! In two years the Quraysh raised a fighting force of ten thousand warriors. This was the largest force ever assembled by the Arabs till that time. With great fanfare, this formidable force left Mecca in February 627 to capture Medina and to obliterate Islam. When news of Meccan war preparations reached Muhammad and the Muslims in Medina, it struck them all with panic. It instilled fear in their hearts as they faced the prospect of being not only defeated but wiped out. The Prophet convened an emergency meeting of his principal companions to consult them in the matter of defending the city. The Muslims were so few in number and so poor in equipment that they could not meet the invading force on the open ground. Medina had to be defended from within. 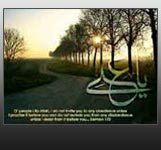 One of the closest friends of Muhammad, the Messenger of God, was Salman-e-Farsi. He knew far more of the techniques of warfare than was common in the Peninsula, advised the digging of a dry moat around Medina and the fortifications of its buildings within. The moat was dug and the Prophet worked with his hands alongside his companions lifting the dirt, encouraging the Muslim workers. Since the Meccan army was approaching Medina rapidly, there was no time to lose, and the Muslims worked frantically. In six days the trench was dug, just in time to prevent the invaders from taking the town by force. The Meccan army came like a storm but was suddenly blocked by the trench. Their grand strategy had been to take Medina by storm in a few hours but now it appeared to them that they could not do so. Eventually, the Meccan commanders decided to lay siege to Medina, and to force the Muslims to surrender, through attrition. Medina was beseiged with all the exit routes cut off. Though it was Abu Sufyan who had master-minded the whole campaign, the real champion of his army was Amr ibn Abd Wudd, one of the fiercest of the warriors of Arabia and was considered to be more than a match for one thousand cavaliers. Amr ibn Abd Wudd had no interest in the passive warfare of a siege and as a few days passed without any action he lost patience, and he decided to capture Medina by own heroics. He and three other Meccan horsemen discovered a rocky point where the trench was not too wide and succeeded in clearing the trenchAmr was inside the boundary of Medina and challenged the heroes of Islam to come out and fight against him in the classical Arabian tradition of duels. Amr's first challenge went unanswered whereupon he repeated it but still got no answer. Such was his fear and awe, that no one in the Muslim camp dared to meet him in a trial of strength. Amr ibn Abd Wudd threw his challenge a third time and taunted the Muslims for their cowardice and that the Muslims were not showing any eagerness to enter paradise where he was ready to send them. Most of the Muslims were frightened but there was one among them, Ali ibn Abu Talib, who was not. He had, in fact, volunteered to accept Amr's very first challenge but the Prophet had restrained him, hoping that someone else might like to grab this oppurtunity. But no one dared to come forward. When Amr hurled his third challenge, and no one answered him, Ali rose and asked for the Prophet's permission to go out and to fight against him. The Prophet of Islam had no choice but to allow his cousin, Ali, the Lion of Islam, to go and to silence the taunts of Amr ibn Abd Wudd. Ali put on the battle-dress of the Prophet of Islam. Muhammad then suspended the Dhu'l-Fiqar to his side, and prayed for his victory, saying: "O Allah! Thou hast called to Thy service, Obaida ibn al-Harith, on the day the battle of Badr was fought, and Hamza ibn Abdul-Muttalib, on the day the battle of Ohad was fought. Now Ali alone is left with me. Be Thou his Protector, give him victory, and bring him back safely to me." When Muhammad saw Ali going to fight his adversary, he said: "He is the embodiment of all Faith who is going to an encounter with the embodiment of all Unbelief." 1. Ali presented Islam to his opponent. He invited him to abandon idolatry and to accept Islam. 2. If the enemy rejected Ali's invitation to accept Islam, he advised him to withdraw from the battle, and not to war against God and His Messenger. Fighting against them, he warned him, would only bring eternal damnation upon him in the two worlds. 3. If the enemy rejected the second option also then Ali invited him to strike the first blow. Ali himself was never the first to strike at an enemy. Amr ibn Abd Wudd rejected the first two options but accepted the third, and struck a mighty blow with his sword which cut through the shield, the helmet and the turban of Ali, and made a deep gash in his forehead. Ali then struck a counter-blow with the famous Dhu'l-Fiqar, and it cut the most feared warrior of Arabia into two! When Amr was killed, his three companions turned round to retreat. Ali let them retreat as one of his principles was not to pursue a fleeing enemy. The death of Amr ibn Abd Wudd broke the back of the Meccan offensive against Islam, and destroyed their morale. Even the weather turned hostile with a raging dust storm and the temperature falling to freezing point. Discouraged and disheartened, the tribesmen began to desert their Meccan allies and Abu Sufyan was compelled to raise the siege and to retreat from Medina. The failure of the Meccan siege of Medina was significant as it meant that they would never be able to mount another invasion of Medina. Medina and Islam had been saved by an idea and a hero. The idea was the trench which immobilized the Meccan cavalry. The honours for saving Medina, the City of the Prophet, and the Capital of Islam, go to Salman-e-Farsi, whom Muhammad himself acknowledged as his friends. Apostle arrived on the scene and he put an end to the argument by saying that Salman was neither a Muhajir nor an Ansar but was a member of his own house – his Ahlul-Bait – a member of the House of Mohammed himself! "Salman is one of us. He is a member of our household." This is the greatest honor ever bestowed upon any of his companions by Muhammad, the Messenger of Allah. Salman was a Christian living in Ammuria in Asia Minor when he first heard vague reports of the appearance of a prophet in Hijaz. To verify these reports, he came to Medina. When his first glance fell on the face of the Prophet, he exclaimed: "This cannot be the face of a man who has ever told a lie," and he forthwith accepted Islam. Even after digging of the trench, Medina was still vulnerable. At a point where the trench was narrow, the general of the Meccan army and three others were able to cross it and to storm into the Muslim camp. But Ali saved the day for Islam. Thus the wits of Salman, the sagacity of Muhammad and the sword of Ali proved to be the best defense of Islam against the most formidable coalition of the polytheists in the history of Arabia. At the siege of Medina, Amr was wearing the finest armor in all Arabia. Ali killed him but did not touch anything that belonged to him to the great surprise of Umar bin al-Khattab. Later, when Amr's sister came to his corpse to mourn his death, she too was surprised to notice his weapons and armor intact. When she was told that it was Ali who had killed him, she composed some verses praising him Ali. "If someone other than Ali had killed Amr, I would have mourned his death all my life. But the man who killed him is a hero and he is peerless. His father was also a lord." After the failure of the siege of Medina, all the tribes between Medina and the Red Sea and between Medina and Yammama to the east, signed peace treaties with theMuhammad, Prophet of Islam. At the beginning of the seventh century A.D., there were three Jewish tribes-Banu Qainuka'a, Banu Nadhir and Banu Qurayza, living in Medina. They were rich and powerful, and two Arab tribes – Aus and Khazraj – were debt-ridden to the Jews perennially. In the beginning the Jews were friendly to Muhammad, acknowledged him the ruler of their city and also agreed to defend the city in the event of an invasion by an enemy. But this friendship did not last long. When Muhammad arrived in Medina and it converted to Islam, the Arabs gave up taking loans at high rates of interest from the Jews, so a rich source of revenue suddenly dried up for the Jews. He had shown to the Jews how their priest distorted their scriptures and the priests, on their part, tried to convince the Jews that Muhammad did not have knowledge of their scriptures, and they tried to point out to them the mistakes in the Qur’an. Of the three Jewish tribes of Medina, the Banu Qainuka'a and the Banu Nadhir had already been expelled after the battles of Badr and Uhud respectively and had resettled in Khyber. So it was the duty of Banu Qurayza, according to the Charter of Medina, to take an active part in defending the city during the siege of Medina. But not only they did not help the Muslims during the siege but actually conspired with the enemy to defeat the Muslims. Some Jews even attacked a house in which many Muslim women and children had taken refuge. The conduct of the Jews during the siege of Medina was high treason against the State and so the Muslims turned their attention to them after the seige was over. The Jews shut themselves up in their forts and the Muslims besieged them. But some days later, they requested the Prophet to raise the siege, and agreed to refer the dispute to arbitration. The Prophet allowed the Jews to choose their own arbitrator and they chose Sa'ad ibn Muadh, the leader of their former allies, the Aus. Here they made a grave mistake of not appointing Muhammad as their arbitrator-who would have spared their lives and allowed them to depart from Medina. Sa'ad declared treason to be an unpardonable offense, and He invoked the Torah, the Jewish Scripture, and sentenced all men to death, and women and children to slavery. The Jews ceased to be an active force in the social, economic and political life of Medina.